Philadelphia’s Continental Theater on Walnut Street was the site of a handful of deadly fires in the late 1800s, the first of these tragedies being the subject of this entry. 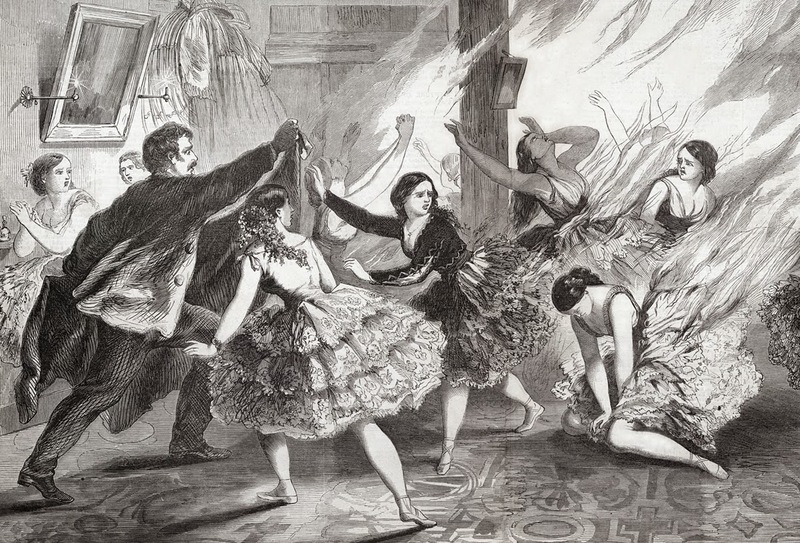 At least eight, but possibly nine ballerinas perished in an inferno ignited after one of the dancer’s gauzy green costumes came into contact with flames from a gas tube backstage. A crowd of fifteen hundred watched William Wheatley’s production of the first act of The Tempest on the evening of September 14, 1861. The show was interrupted by strange lights from behind the scenery, followed shortly by screams, stage carpenters rushing onto the platform and the appearance of a young dancer engulfed in flames. This dancer, Zelia Gale, screamed and waved her arms frantically as her costume and skin melted away. She finally fell beneath the stage where a carpenter covered her in a sea cloth from the set design. As the curtains dropped the screams of other dancers backstage became more audible. Initially the manager tried to calm the crowd but when the magnitude of the situation became clear he told them that the show would not continue and evacuated the building. Meanwhile, a horrific and chaotic scene continued in the dressing room part of the theater. Zelia (also called Cecilia) was one of four English-born sisters, all ballerinas. 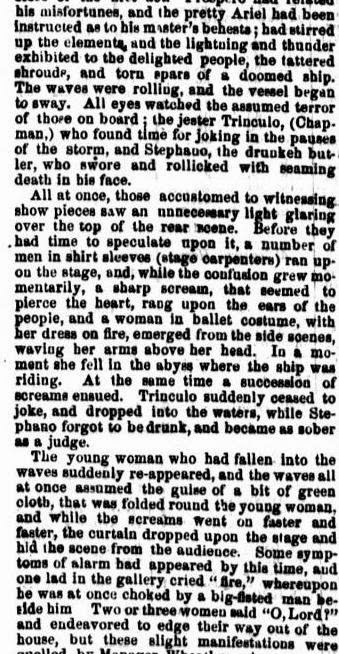 The Sept. 18, 1861 issue of The National Republican reported that as the Gale sisters readied themselves for Act II Zelia (age 18) reached down to adjust her costume near a gas tube. The gauzy material ignited and within seconds the flames also reached her underclothes and leggings. When her sisters came to the rescue their dresses also caught fire, terribly burning their upper bodies. In the panic the dancers, flaming and not, either ran screaming throughout the theater, swatted at the fire where they stood or leaped from the window onto Sansom Street. Clara Clifton, whose clothing didn’t catch on fire jumped from the window and fortunately survived uninjured. Hannah Gale (20), already severely burned, landed on the street below on her back. Anna Nicholas jumped ten-twenty-five feet from a platform to the stage, shattering a plate of glass and lot of mirrors used in the production. The National Republican had little hope for her at the time that article was printed. The injured dancers were initially taken to Greer’s Tavern, nearby homes, or a hotel where they were treated with brandy by druggists and doctors as they continued to scream in agony. Finally the ballerinas made it to Pennsylvania Hospital. The confirmed dead from the tragedy were the four Gale sisters, Mary Herman, Phoebe, Annie Phillips and Anna McBride. 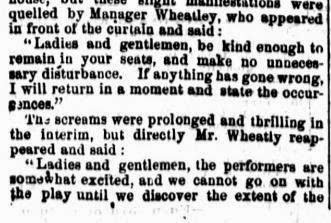 Mr. Wheatley was not held liable for the tragedy and he and his wife held some of the dancers’ funerals from their home and paid for those arrangements. 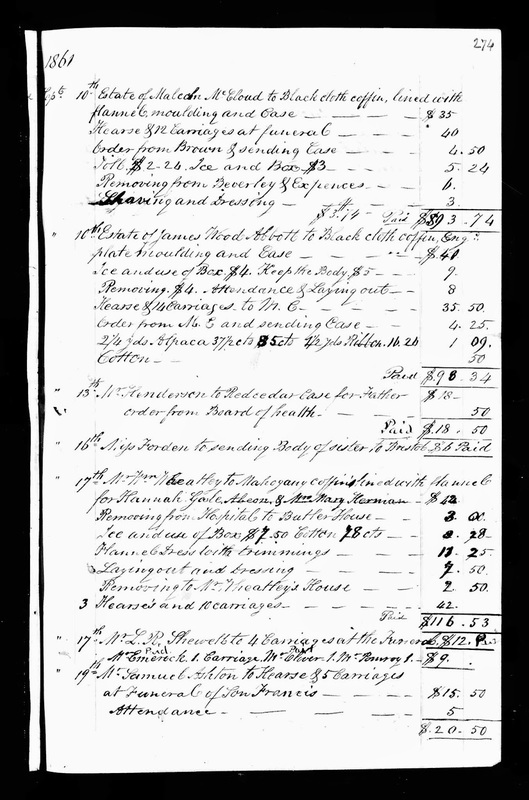 I dug up records from the Brighthurt & Co. Funeral Home itemizing the costs and showing which funerals took place on the same days. 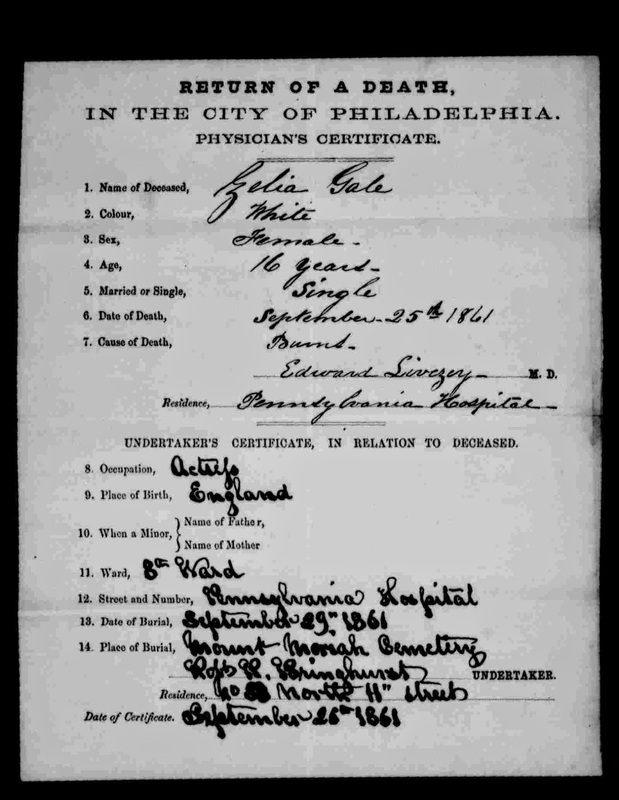 I’ve included those, as well as the Gale sisters’ death certificates, below. The Gales are buried in Mount Moriah Cemetery. 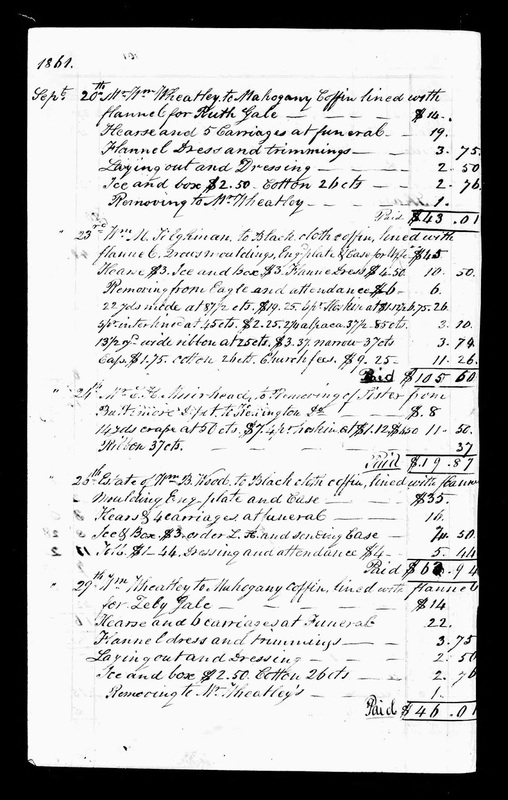 Anna McBride was interred at Old Cathedral Cemetery based on the Brighthurt records. Phoebe, who’d been boarding in Philadelphia, was shipped back to Bristol for burial. Presently I don’t have burial information for the other ballerinas. 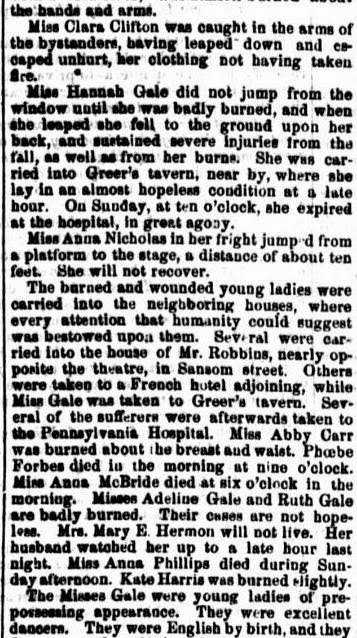 “The recent terrible accident at the Continental Theatre in Philadelphia. 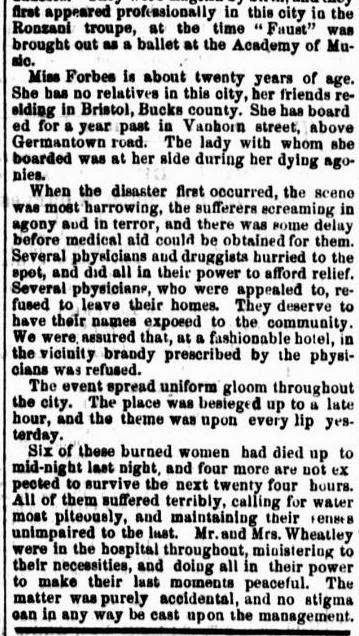 An unfortunate accident occurred at the Continental Theatre, in Walnut street, on Saturday night, by which the building for a time was imperilled, and a number of dancing girls so badly burned that some have since died. Wheatley leased and refitted the “Continental, ” (formerly General Welch‘s National Circus,) and produced the “Tempest,” on Monday night, in splendid style. On Saturday night more than fifteen hundred people were present. 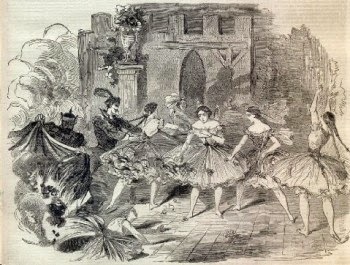 The first act had gone forward uninterruptedly, and the dancers were busily preparing in the dressing room to appear in the ballet at the opening of act second. Prospero (Wheatley) was about retiring from the stage, when the audience perceived several men, apparently stage carpenters, running backward and forward in their shirt sleeves. Directly those adjacent to the stage saw a young lady all on fire run hurriedly to the side scenes, and at the same time a succession of piercing screams, from imperceptible localities, disturbed the repose of the audience, and brought half the people to their feet. The cry of “fire” was started from the galleries, and the flitting lights and confusion upon the stage left no doubt that some awful actuality was transpiring. Manager Wheatly directed the people to be quieted, while he retired to learn the extent of the accident. It appears that Miss Cecilia, one of four talented and handsome sisters, was about robing herself in ballet costume. She stood upon a settee to reach her dress, and somehow flirted it into a jet of gas, when it was instantly ignited. 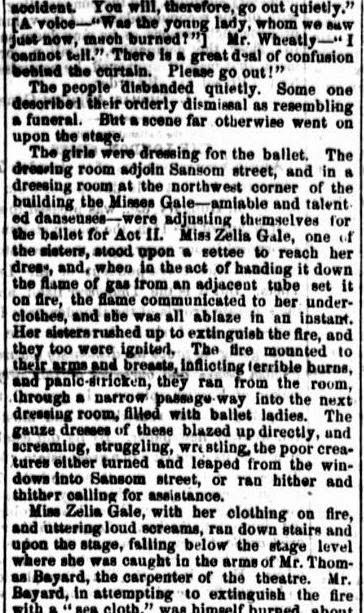 Before the young lady could recover from her fright her clothing was all ablaze, and her sisters and several of the ballet girls from an adjoining dressing room, rushing up to assist her, were in turn set on fire. About a dozen of these helpless girls were thus burning at once, and the fire ran over their gauze and among their underclothes, making fast to their close leggins or ‘tights,’ and literally burning to the bone. Their scream were thrilling, and no scene of horrors that the stage ever witnessed may be compared to the terrible picture behind the scenes, where the fire from the burning dresses blazed up to the ceiling and singed the lashes and hair of the affrighted women. Miss Cecilia Gale, writhing and still in flames, darted down the stairs as stated, and was caught by Mr. Bayard, a stage carpenter, who at once tore up the sea cloth, a sheet of canvas used to make waves, and wrapped it around her. He was much burned while doing this. The young lady was removed to the hospital soon afterwards. 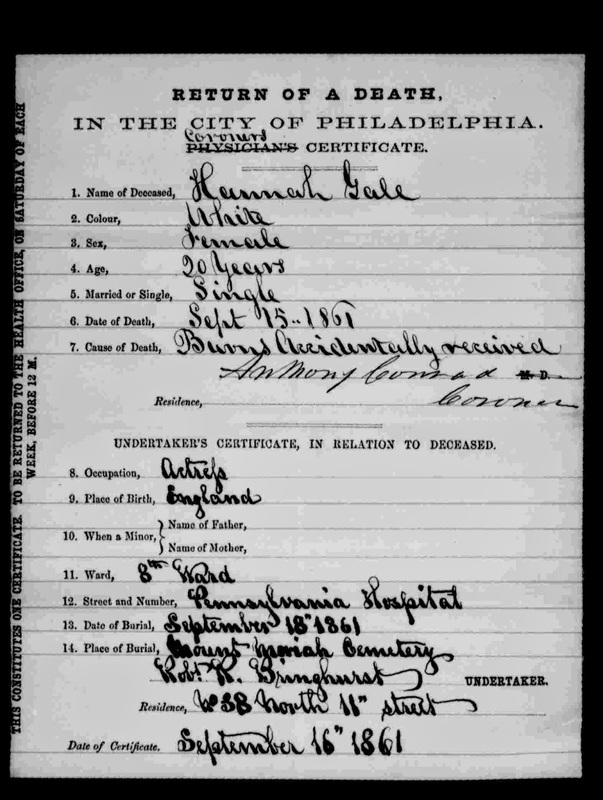 Several girls leaped into the street, through the second story windows, and Miss Hannah Gale, already badly burned, fell upon the pavement, bruising her back and head so that her case is considered hopeless. Miss Phœbe Norden, of Bristol, Pennsylvania, inhaled the flames and was shockingly burned. She was at the point of death last evening. Miss Annie Phillips died on Sunday morning. 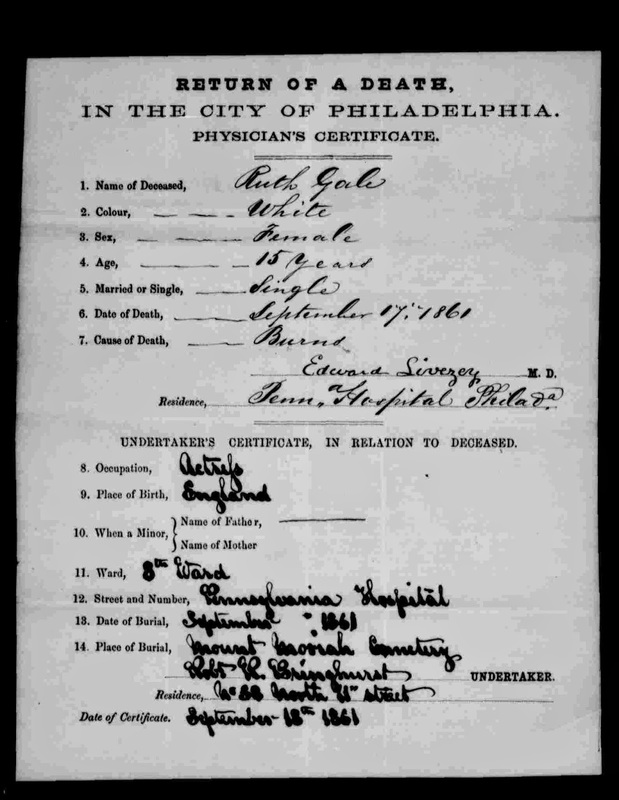 Miss Anna McBride was burned in the breast, arms and legs, and taken to the Pennsylvania Hospital. She suffered the most excruciating pain during Saturday night; but towards morning her delirium abated, and she died in the arms of Mrs. Wheatley. Miss Annie Nicholas was somewhat burned, but in the panic which ensued after the accident she jumped from the head of the flies to the stage–twenty-five feet–and breaking through a lot of mirrors and plate glass used to represent a lake, her hands and cheeks were lacerated. 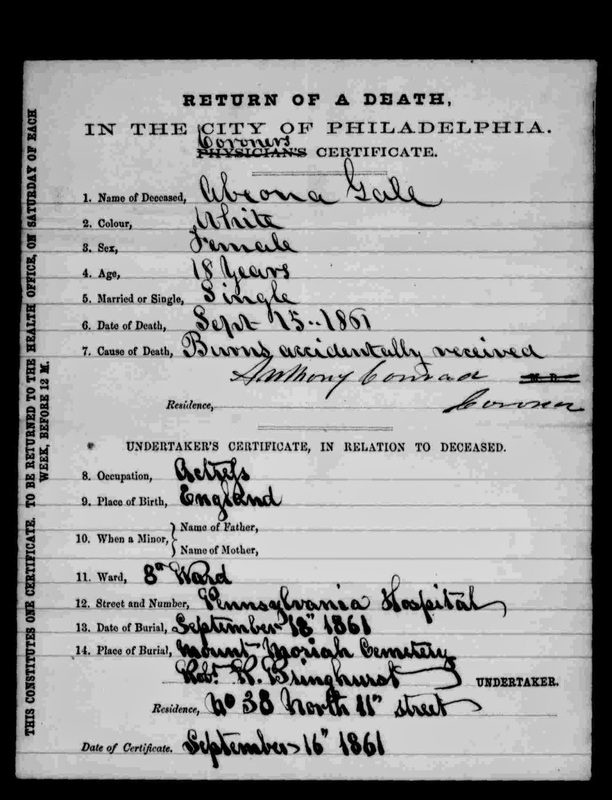 Ruth and Adeline Gale were burned in the hands and breast. Mrs. Mary E. Herman suffered exceedingly. Abby Carr, Margaret Conway, Thomas Bayard, Kate Harrison, and a young man, name unknown, were more or less badly burned. The last named inhaled the fire and his lungs have since been bleeding. The audience meanwhile was addressed by Mr. Wheatley, and told to vacate the house without unnecessary confusion. A number of ladies fainted on retiring, and there was a great deal of trepidation and alarm in the halls and exit way. The scene in the rear of the theatre, on Samson street, was most piteous and agonizing in its character. Half-dressed ballet girls ran up and down, and poor women, whose daughters took part in the precession and show scenes, were screaming their names amid confused sobbing, execration and fear. Carriages and cabs were driven up and down, and as each sufferer was placed upon the cushions and taken away, the crowd pressed up and touched her sores. The excitement continued to spread throughout the city, and all Saturday night and Sunday morning the theatre was surrounded by curious crowds. The Gale sisters were beautiful and finely formed girls, English by birth, and they traveled through the country, some time ago, with the Renzani troupe. The management cannot be blamed in any way for the occurrence. The theatre will open as usual on Tuesday, and on Wednesday the sufferers will receive a benefit. The event has spread gloom and sorrow throughout the city. Thank you for this article! I’d never hear of this incident, though I have enjoyed reading up other, similar accidents. Two worth knowing are Emma Livry and Clara Webster. You can find out about their mishaps in newpaper databases, but Clara is a tricky one to read about because almost everything I can find about her is in French. Please post more if you find them!